Amazon, Google and Apple voice assistants are changing the way people search online. Voice assistants are starting to have a huge impact on the way people find information online, as search phrases become more natural and conversational. 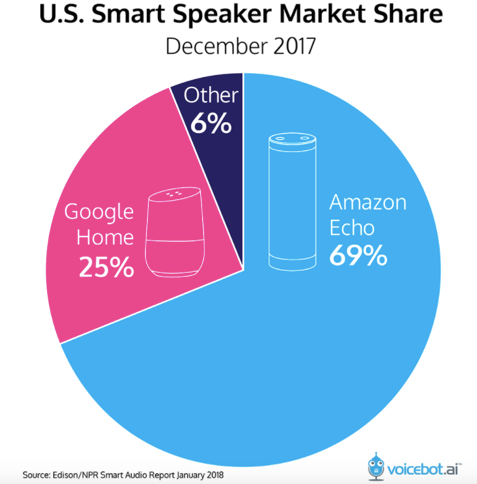 Amazon Echo is the clear leader in the US for in-home voice searches, followed by Google Home with Apple a distant third. Siri has been giving iPhone users answers for a while now - as Amazon Echo and Google Home enter the home voice assistant market, voice search continues to grow. Apple has also recently staked its claim in the home market with its HomePod smart speakers. It’s important for online marketers to understand how people are searching online, as site visits from search results are extremely valuable. Users will tend to view a site as more credible when they see it appear organically in search results, and will be more likely to trust its messages. Organic visitors are also likely to be more engaged, especially when a search listing has content relevant to their search phrase, or provides a specific answer to their question. This means visitors are much less likely to bounce (leave the site without clicking to another page) and much more likely to result in a conversion (such as joining a fund or registering for online banking). The other great thing about search traffic is the way it can be increased cost-effectively, through the process of search engine optimisation (SEO). Most people are more or less familiar with the concept of SEO if not the details - it’s a field that has been around for quite a few years now and reached a level of maturity in the digital marketing mix. Spark Green has been providing SEO services for over 20 years now (since before Google launched!). But as with any digital field, it continues to evolve as technology progresses. As voice search becomes more mainstream, the SEO process needs to adjust. Voices searches are more natural and conversational, which usually results in longer phrases. Longer search phrases are generally much more descriptive of the user’s intent. When we know more about a user’s intent, we can more easily create website content to match it. Click here for an example of the types of longer phrases that people might be searching about super. Longer search phrases present both an opportunity and a challenge – an opportunity to provide more relevance and value to the user, and a challenge to identify more and more specific phrases and create content that answers user’s questions. There are also types of queries that will only be possible with voice assistants, such as “OK Google, what’s happening in the city today?” or “Tell me about my day”. As more data becomes available on the different ways that voice search is being used, more opportunities will become apparent. If the answer to a user’s query is found in a knowledge box, Google Home will read out the text in the box, as well as the name of the of the site the snippet came from. If you’re able to get some content from your site into a knowledge box, your site could potentially get a huge amount of exposure if Google Home uses it to answer queries. It’s important for anyone with an SEO strategy to consider the implications of voice searches. This isn’t something that will happen in the future, it’s happening now. Those who fail to consider voice search as part of their strategy will be left behind by those who do.